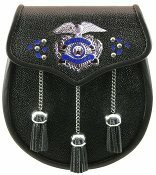 This sporran has a black grained front and back, three black tassles on chrome chains/balls and a high quality "Police Officer" badge mounted on the flap. The flap features blue accents and chrome studwork surrounding the badge. This sporran will stand up well to repeated use in all types of weather. We are more than happy to mount your Department's badge on the sporran instead of our standard badge. Simply advise us of your choice at time of ordering and then ship your badge to our location and we will mount it during the manufacturing process.